Levels - Website of the open source Sokoban game JSoko. This tab can be used to display and to modify the level data stored in the database. The levels to be displayed can be filtered through the shown selection fields. Example: if the text "*connection*" is entered in the field "Title" and the "enter" key is pressed JSoko selects all levels whose title contains the string "connection" and displays them. If additionally the text "Matt*" is entered in the "Author" selection field JSoko selects all levels whose title contains the string "connection" AND whose author name starts with the letters "Matt". Usually there aren't that many authors and collections stored in the database. Hence, JSoko provides a drop down box for these fields when the little arrow is pressed. This list can be used for directly choosing a specific collection or author. The levels are selected from the database according to the entered texts in the selection fields every time the enter key is pressed or an item has been selected of one of the drop down lists. This graphic shows a possible display of some level data. The table contains 4 columns. The columns contain the following data: level title, level author, collection the level is assigned to - and the difficulty of the level. You can select a table row or multiple rows with the mouse. The first selected level is graphically displayed in the GUI. To change the title or the difficulty the relevant cell must be double clicked with the mouse. The author of a level can be switched to another author by simply clicking on it. This opens a list of all available authors from which a new author can be chosen. Play level: You can select levels in the &quot;Selection result table&quot;. 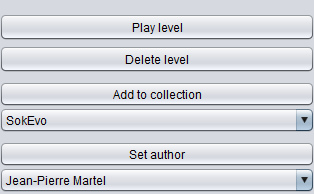 If this button is pressed the database GUI is closed and the all selected levels are loaded for playing them in the game. Delete level: Deletes all selected levels. Add to collection: Adds all selected levels to the set collection below this button. 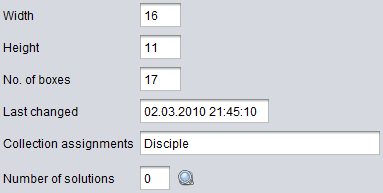 Set author: Sets the author selected in the drop down box under this button as new author for all selected levels. These fields display: the width and height of the level in squares, the number of boxes in the level, the last time the level has been changed in the database, the collections this level is assigned to and the number of stored solutions for this level. 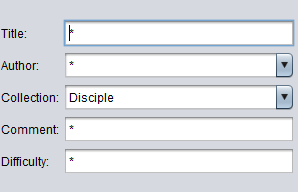 All of these fields aren't editable. The comment may be changed and then saved by pressing the save button.